ALBUQUERQUE, N.M. — Millennials are returning to one of civilizations most ancient traditions – working the land. Whether it’s a business, an urban farm, a plot of land shared by the neighborhood or a garden in their own backyard, the generation that was born after 1980 is planting their hands in soil. According to the 2013 National Gardening Association Special Report: Garden to Table, which comes out every five years, there were 13 million millennial gardeners that year, an increase from 8 million in 2008. The 2016 National Gardening Report says 5 million of the 6 million new gardening households last year were 18- to 34-year-olds. Seth Matlick, 32, grew up in New York, the country’s ultimate concrete jungle. Besides some houseplants, he said he never grew anything or visited a farm. He now operates and owns Vida Verde, a four-acre organic vegetable farm in the North Valley. The farm grows more than 300 types of vegetables, fruits, herbs and flowers. It sells the produce and herbs to 15 local restaurants and La Montañita Co-op. Matlick’s farm also participates in the Community Supported Agriculture program, which helps financially support their operation while providing community members with fresh produce. Matlick said program participants essentially buy a share of the farm at the beginning of each calendar year. In return, they receive a box of fresh produce weekly for 26 weeks. After attending college in Vermont and studying sociology and business, Matlick started working at the Bronx Zoo but soon became restless. He said he decided to travel and found himself in New Mexico, a place he had never visited. He fell in love with the openness of the state and the opportunities to be outdoors. A friend suggested to him that he try a farming internship and he did just that. Matlick wasn’t quite ready to trade in his ticket to the concrete jungle though. He wanted to farm while still having access to city life. Matlick said when he was growing up urban farms and community gardens were not something available to city dwellers. He said he’s seen it become more popular among his peers, but like him, although they embrace the craft, they aren’t necessarily willing to abandon city living all together. Albuquerque resident John Philpott, 26, is originally from Nebraska where he said he saw a lot of large farms but not a lot of individual farming and gardening. His parents had a small garden but it was never something he really considered as an adult until he worked at a grocery store. A few months ago Philpott and his wife relocated to Albuquerque from Gallup, where they had established a hearty garden. Philpott said he used the internet to teach himself about the best techniques and methods for gardening. 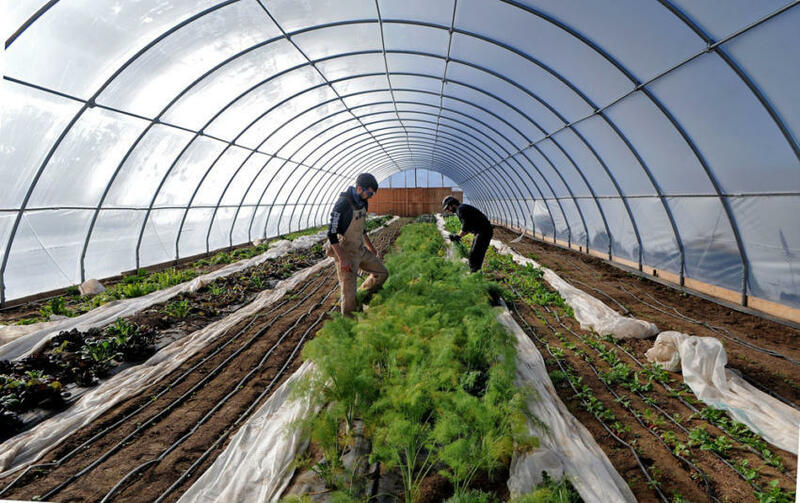 The couple installed a hoop house, which functions as a greenhouse, to bolster their yield. Inside they planted vegetables, including beets and carrots. They now live in a duplex in the Wells Park neighborhood, so they don’t have enough space for a hoop house. Philpott hasn’t let that deter him. He has placed his vegetables inside a raised planter box with a plexiglass window that protects the garden from wind and helps trap the heat during the cold months. North Valley resident and New Jersey native Sean Foran, 32, said he’s literally reconnecting with his roots by planting roots. His family, he said, is from Italy and growing their own food is a longtime tradition. He had a grandparent nicknamed “Strawberry Grandpa” because he was so well known for the strawberries he grew. He got his start in college when he helped create a community garden as part of his social work degree. He and his wife have started a small garden in their backyard growing tomatoes, lettuce, kale and fruit trees as well as raising their own chickens.